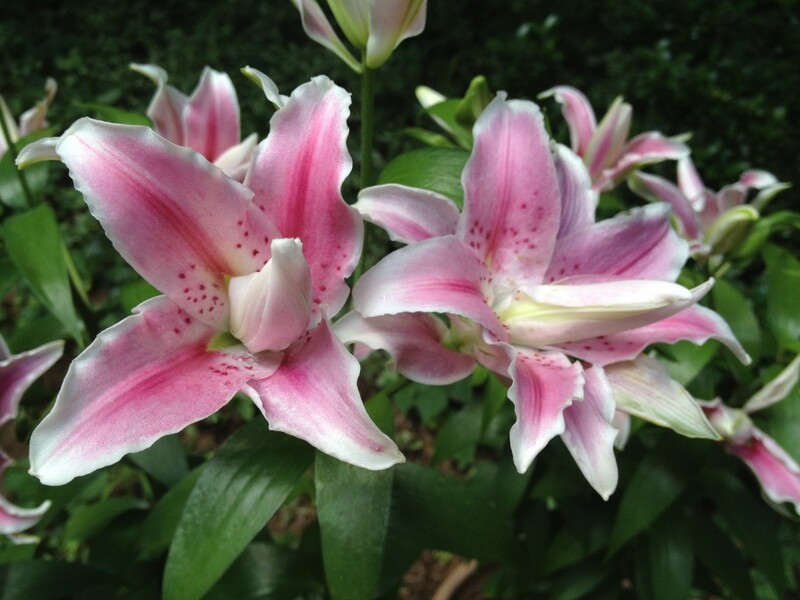 Talk about lucky–I was offered some new lily bulbs to test-trial in my garden this year. Of course I said yes! And you can see how beautifully they’ve grown in these pictures. These are so new, they aren’t being offered for sale yet. What makes them unique? Look closely, and you’ll see that the breeder has developed lilies that don’t have stamens, the parts of a flower (technically, the anther and filament) that contain pollen. This is a big deal because Oriental lilies are beloved for their gorgeous blooms and sweet fragrance–but not for their stamens, which dust everything that comes in contact with them with yellow-orange pollen. That pollen stains clothes and skin. The stains on your hands last for a couple of days. If you get the pollen on your clothes–well, hope you like wearing orange polka dots. These lilies avoid that problem altogether. 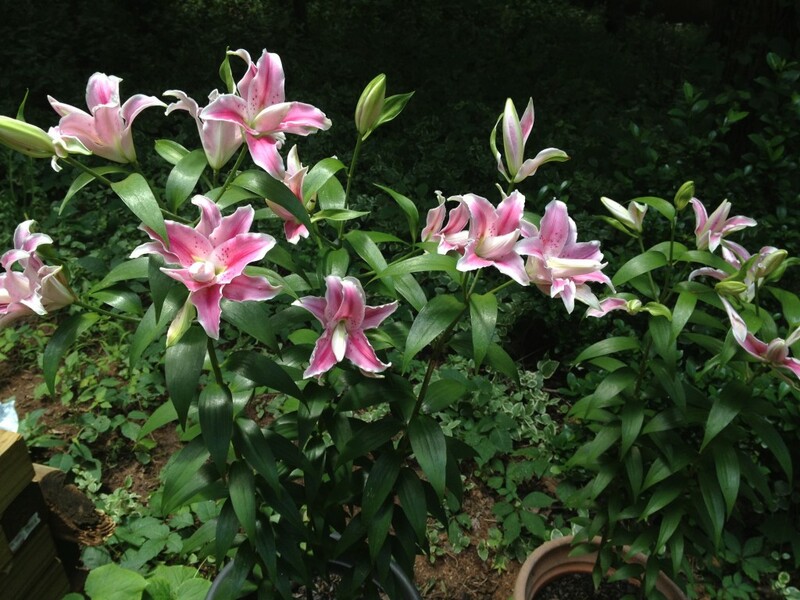 I’m trialing these lilies in white, too, and they are absolutely spectacular. Haven’t seen a bug or a sign of disease on them. I can’t tell you who’s going to be selling them yet, but I hope to spill the beans soon. In the meantime–feast your eyes here. Wish this was scratch-and-sniff, so you could enjoy their perfume, too! Oh wow!! No stamens would be wonderful. My mom used to have these that she would cut and put into arrangements for the restaurant, and it was always a guarantee that she would have dust on her white shirt when she was done! I know! That’s the main reason I haven’t grown Stargazer lilies before–they stain everything! Thanks for writing, Christa! When I worked at a flower shop we pulled the stamens out. No stains on clothing, bu then you have orange fingertips. And it has to wear off. Messy but they are beautiful! Brilliant! I use tweezers to de-stamen lilies when they come into the house. Can’t wait to see these lilies when they’re available in stores. That’s a great idea, Lucy. Hope these come out soon–you’d love them. Can’t wait for these! Stunning and no pollen! I’ll be sure to post the info as soon as I hear they’re available, Teresa! They are SO beautiful, and fragrant, too! These are great! I wonder if they are poisonus still to pets? I love stargazer lilies, but so worried about my dog and cat eating them. (They eat any flower that crosses paths with my property). If you contact them and find out, please let us know. Thanks for writing! Thanks for the tip, Sharron! I’ll try this on a scrap of fabric with some of the orange pollen from the regular Oriental lilies. I’ve never been able to get that kind of pollen out before! Hi Lynn: Are these out for sale for 2014 planting? If yes, where can we buy these? I am in Zone 6. Thanks. Lily Lover, I’m pretty sure these are available for sale now. Look for them at Longfield Gardens, http://www.longfield-gardens.com/. Mine came back up, even though we had record low temperatures here in my Georgia garden (2.5 degrees one night!). I can’t wait for them to bloom again. Hope you can find them okay!